An exhibition featuring work from a collective of artists who chose to Bounce back when their artworks were destroyed by an arson attack. In 2010, Terry Hartshorn, an artist and resident of Stretton-under-Fosse approached the Malt Kiln Farm Shop also in Stretton-Under-Fosse with the idea of opening a gallery adjacent to the already popular farm Café. The resulting Gallery offered a bright, airy space and an excellent outlet for the work of several well established and new up and coming artists living and working in Leicestershire and Warwickshire. By 2016 the gallery was attracting the work of numerous artists based in Warwickshire, Leicestershire and even Northamptonshire. The Gallery had proved to be so successful for Malt Kiln Farm and the exhibiting artists that extensions to the existing Gallery and Café were planned. Then on 26th June 2016, the complex was struck by disaster in the shape of an arson attack. Fire swept through the building, completely destroying the farm shop, cafe and the gallery. Five fire engines from Rugby, Nuneaton, Coventry and Binley, the command support vehicle, water bowser and aerial platform from Leamington Spa were deployed to tackle the flames. The artists lost all the artworks, easels, display boards and other equipment and a local family lost its business, all destroyed in a couple of hours A rare and vital community facility and a huge expression of creative endeavour were lost in one senseless, wicked and violent act. Thankfully, the owners of the farm shop have proved to be resilient and the shop, cafe and gallery have since reopened and the community of artists have also been undaunted by this tragic incident. 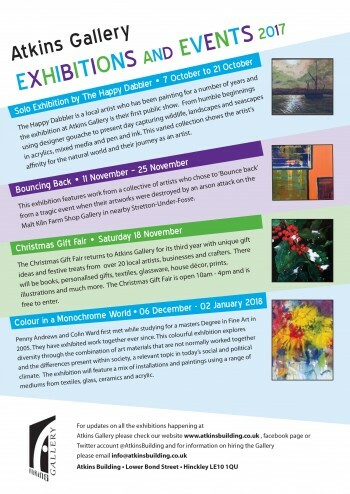 “Bouncing Back” is an exhibition of work in reaction to the fire and loss of a creative space on display at the Atkins Gallery, Atkins Building, Lower Bond Street, Hinckley from 11th - 25th November. Work by local artists; Michelle Leche, Terry Hartshorn, Paul Percival, Jackie Ward, and Janet Watson will be on show. The work speaks of a new beginning, new ideas and offers a view of an exciting future. Demonstrating that creativity will always shine through. Penny and Colin first met while studying for a masters Degree in Fine Art in 2005. They have exhibited work together ever since. This exhibition explores diversity; in the combination of art materials not normally worked together and differences within society. Penny Andrews, a textile artist, uses her psychotherapy background as a starting point for creative work. In her work for this exhibition she explores childhood issues. Children under the age of 10 make sense of the world and their experiences with limited knowledge and understanding. How they interpret their world during these early years can have an impact on their future lives. Penny’s work explores the impact ridicule and humiliation can have on creativity. Colin Ward, fine artist, has been practising art from an early age. He has always used a wide variety of materials in his work. In this exhibition Colin has been exploring unusual combinations of medium; glass with ceramics, glass and fabric, acrylic on canvas combined with fluorescent celluloid. Colin’s work is inspired by people and nature.